Corporate Social Responsibility (CSR) is steadily moving from the margins to the mainstream across the spectrum of private companies, NGOs and the public sector. It has grown from being a concept embraced by a small number of companies such as The Body Shop in the early 1990s to a widespread global movement. At its weakest level, it is represented by a few philanthropic gestures by organizations but, when applied in its most complete form, it can steer the organization or sector to deliver a fully fledged, system-wide, multi-stakeholder operation, accompanied by multiple types of certification.For the first time, a book brings together key issues relating to CSR as they apply to different aspects of business; it is not another generalist title about CSR. 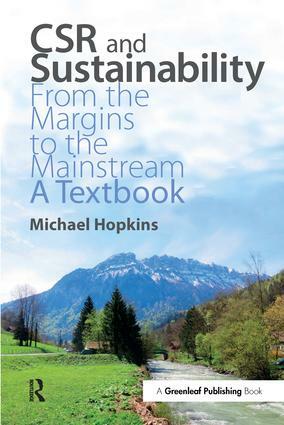 Michael Hopkins, a leading expert in the field, is joined by a number of outstanding contributors to the book, to explain how CSR has evolved since the 1990s and to offer ground-breaking insights and practical and specific applications of the concept. For example, Mervyn King explains Integrating Reporting, Deborah Leipziger looks at the laws and standards for CSR, Branding and the Supply Chain, George Starcher provides a framework for Socially Responsible Restructuring, and Adrian Henriques explores Social Accounting and Stakeholder Dialogue.